"Why," an exasperated Jonathan Edwards asked, "can't we be contented with. . . the canon of Scripture?" Edwards posed this query to the religious enthusiasts of his own generation, but he could have just as appropriately put it to people across the full expanse of early American history. In the minds of her critics, Anne Hutchinson's heresies threatened to produce "a new Bible." Ethan Allen insisted that a revelation which spoke to every circumstance of life would require "a Bible of monstrous size." When the African-American prophetess Rebecca Jackson embarked on a spiritual journey toward Shakerism, she dreamt of a home in which she could find multiple books of scripture. Orestes Brownson explained to his skeptical contemporaries that the idea drawing him to Catholicism was the prospect of an "ever enlarging volume" of inspiration. Early Americans of every color and creed repeatedly confronted the boundaries of scripture. Some fought to open the canon. Some worked to keep it closed. 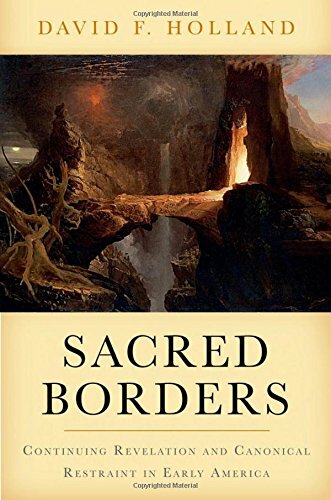 Sacred Borders vividly depicts the boundaries of the biblical canon as a battleground on which a diverse group of early Americans contended over their differing versions of divine truth. Puritans, deists, evangelicals, liberals, Shakers, Mormons, Catholics, Seventh-day Adventists, and Transcendentalists defended widely varying positions on how to define the borders of scripture. Carefully exploring the history of these scriptural boundary wars, Holland offers an important new take on the religious cultures of early America. He presents a colorful cast of characters-including the likes of Franklin and Emerson along with more obscure figures--who confronted the intellectual tensions surrounding the canon question, such as that between cultural authority and democratic freedom, and between timeless truth and historical change. To reconstruct these sacred borders is to gain a new understanding of the mental world in which early Americans went about their lives and created their nation.